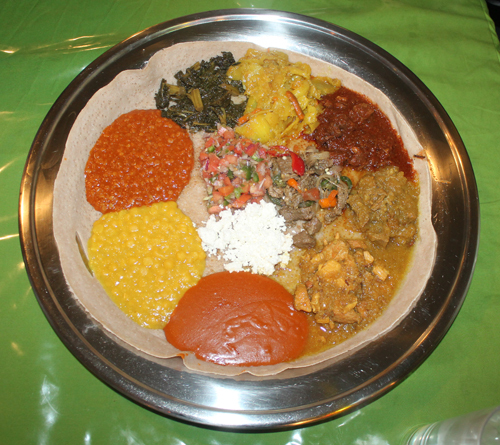 Ethiopian food characteristically consists of vegetable and often very spicy meat dishes. This is usually in the form of wat, a thick stew, served atop injera, a large sourdough flatbread made out of fermented teff flour. 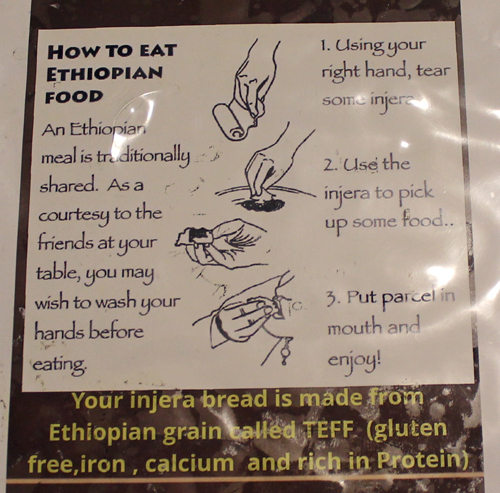 Ethiopians use pieces of the spongy injera to pick up bites of entrées and side dishes instead of silverware. The Cleveland Food Adventurers Passport event in November 2017 was to Ethiopia at Zoma Ethiopian Restaurant. In this video clip, Zeleke Belete, owner of the Ethiopian Restaurant Zoma in Cleveland Heights Ohio, told the ClevelandPeople.Com Food Adventurers that they had entered a Fork Free Zone and explained that Ethiopian food is eaten with the spongy injera bread instead of silverware. 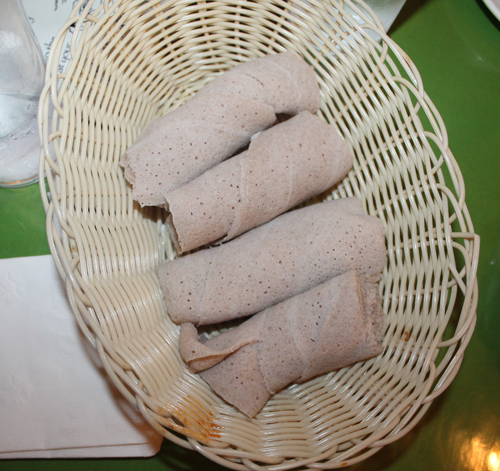 A typical dish consists of injera accompanied by a spicy stew, which frequently includes beef, lamb, vegetables and various types of legumes, such as lentils. Meat along with vegetables are sautéed to make tibs. Tibs is served in a variety of manners, and can range from hot to mild or contain little to no vegetables. There are many variations of the delicacy, depending on type, size or shape of the cuts of meat used. In this video, Zeleke describes the foods on the platter. Over 60% of Ethiopians belong to the Ethiopian Orthodox Church which prescribes a number of fasting periods, including Wednesdays, Fridays, and the entire Lenten season, so Ethiopian cuisine contains many dishes that are vegan. Zeleke was asked about condiments like mustard and ketchup with Ethiopian food. He said they use ginger, garlic, jalapenos, etc. He was also asked about the hot spice in some of the dishes and said that it was a jalapeno pepper. The Food Adventurers had many more questions about Ethiopian food – what a typical meal is, what a holiday meal would be, Honey Wine, fried food, sweets and desserts and so on. Zeleke answered them all. 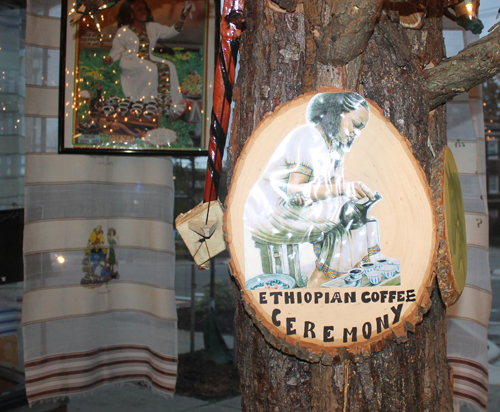 Coffee is also a large part of Ethiopian culture and cuisine. After every meal, a coffee ceremony is enacted and espresso coffee is served. The coffee ceremony often involves the use of a jebena, a clay coffee pot in which the coffee is boiled. The preparer roasts the coffee beans right in front of guests, then walks around wafting the smoke throughout the room so participants may sample the scent of coffee. Then the preparer grinds the coffee beans in a traditional tool called a mokecha. 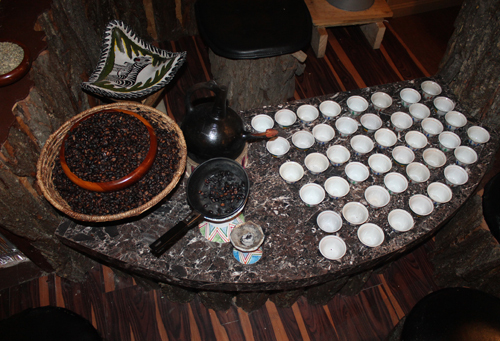 The coffee is put into the jebena, boiled with water, and then served with small cups called si’ni. Coffee is usually served with sugar, but is also served with salt in many parts of Ethiopia. In some parts of the country, niter kibbeh is added instead of sugar or salt. Snacks, such as popcorn or toasted barley (or kollo), are often served with the coffee. Zeleke Belete, owner of the Ethiopian Restaurant Zoma in Cleveland Heights Ohio, hosted a ClevelandPeople.Com Food Adventurers event. As the coffee was being prepared he told the people why they serve snacks during the Ethiopian coffee ceremony.